website https://kluniversity.in/kluh/default.aspx. 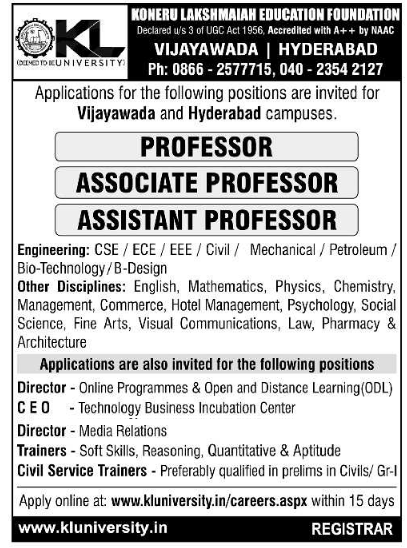 for K.L University Associate Professor / Assistant Professor/ Directors/CEO/Trainers Posts. The Final Date to apply online application will get ends within 15 days from the advertisement date. 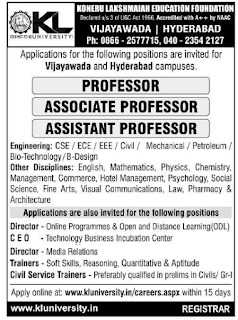 Remaining details like Salary, Important Dates, Available Vacancies, Qualification, College Address are maintained given below. Starting date : within 15 days from the advertisement date. Interested Aspirants can apply ONLINE to the college web site is Maintained below.